1. Cut off the top 1/3 of your TP roll. Paint it green and let it dry. 2. Place your TP roll on top of your green paper, flush with the bottom of the paper. Draw frogs' legs around the TP roll and cut out. 3. Your frog's legs should look something like in the picture. 4. Cut two slits in the TP roll, opposite each other. Slide your frog's legs into the slits so that they are flush with the bottom of the TP roll. Glue on your eyes and draw on a friendly frog smile! 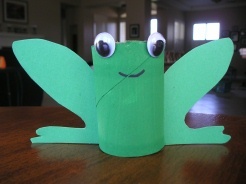 Click here to find more Reptile Crafts like the TP Roll Frog!